Rodelle Gourmet Brine is made with the finest, wholesome ingredients to elevate your choice of protein from good to great. Brining locks in the moisture in poultry, pork and fish to enhance flavor with the perfect blend of spices and fruit. Our Rodelle Gourmet Brine stands out from the competition because of the addition of vanilla beans which add a subtle vanilla flavor and aroma, ensuring your family will truly savor your meal ahead! 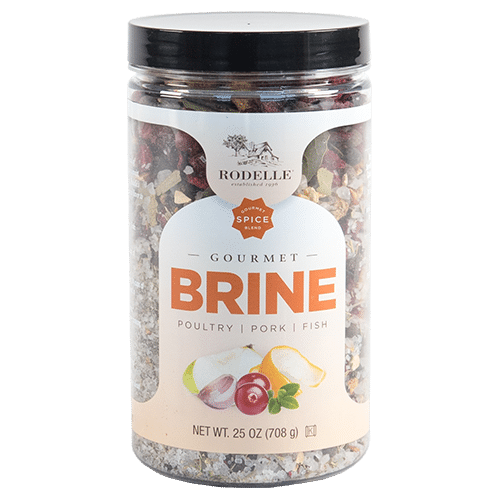 Unique to Rodelle Rodelle's Gourmet Brine is the only brine mix available with vanilla beans. We take care to select only the best ingredients available (see full list below). 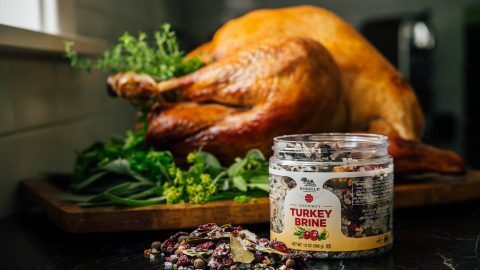 Use Rodelle's Gourmet Brine to add a delicious flavor to your turkey, chicken, fish or pork - for a taste that your family will remember and ask for again and again! Directions for Use: For a turkey up to 18 pounds: Mix 2 cups of brine from the 25 oz container with one gallon of boiling water, cool thoroughly and refrigerate until chilled. Place thawed turkey, brine mix and an additional gallon of water in a large container or bag so the turkey is submerged completely. Keep cool and let brine for 12-24 hours. Rinse and pat dry turkey prior to roasting. Before using, shake container well as contents may settle. Mix 2.5 tablespoons of brine seasoning to 1 cup of boiling water (scale up with this measurement ratio for each additional pound of meat or fish). Cool thoroughly and refrigerate until chilled. Place thawed meat, brine mix and an additional 3/4 cups of water (per pound) into a large container or bag so that meat is submerged completely. Keep cool in refrigerator or on ice for 12-24 hours! NOTE: for fish, brine up to 35 minutes total. Rinse meat/fish and pat dry prior to cooking. Follow cooking directions for your protein of choice. Sizes: Available in 25 ounce container.